Provide comfort for the family of Rachel Sells with a meaningful gesture of sympathy. Gaffney -- Mrs. Rachel Sells, 87, of 209 York Drive, passed away on January 16, 2019 at BlueRidge Healthcare In Brookview House. Born in Kings Mountain, she was the daughter of the late Charles Chamberlain and Clara Chamberlain. Rachel previously worked as a Homemaker. Surviving Mrs. Sells are one daughter, Tina Stacey, and husband, Bobby; three grandsons, Phillip Jones of Salisbury, NC, Ryan Peterson, and wife, Katie, and Hayden Peterson; four granddaughters, Ashley Marlowe, Kendale Jones, Shannon Jones, and Jessica Stacey; five great-grandsons and three great-granddaughters. The family will receive friends on Sunday, January 20th, 2019 from 1:30-2:30pm at Southside Baptist Church, 204 W Oneal St, Gaffney, SC 29340. A memorial service will follow at 2:30pm with Rev. Wofford Caughman and Rev. Jeff Upright officiating. The family would like to give a sincere thank you to the staff and friends at Brookview Nursing Home for the care of Mrs. Sells. Memorials may be made to Southside Baptist Capital Improvement Fund, 204 W Oneal St, Gaffney, SC 29340. The Gaffney location of Gordon Mortuary is serving the Sells family. 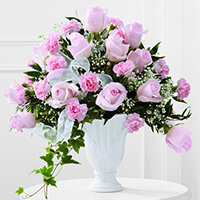 To send flowers to the family of Rachel Chamberlain Sells, please visit our Heartfelt Sympathies Store. AMG Management Team sent flowers to the family of Rachel Chamberlain Sells. We are sorry for your loss. You and your family are in our prayers. AMG Management Team purchased the The FTD Deepest Sympathy Arrangement for the family of Rachel Sells. Oh how I loved "Stinky", her absence will be felt by many for years to come. I love you all and am so sorry for your loss. The best mother inlaw in the world.I sure am going to miss you always so funny and full of life who am I going to pick on now.I love you mom until we meet again..